We're almost at the end of the Catalan series! 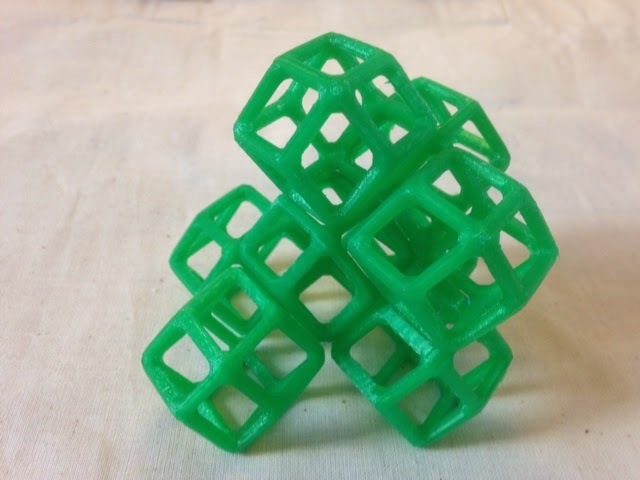 Today we printed our eleventh, the Rhombic Dodecahedron, dual of the Cuboctahedron (which we also constructed with printed snap-tiles on Day 87). Settings: MakerWare .3mm/low with custom reduced-support slicing profile, on a Replicator 2. Technical notes, tessellation flavor: The Rhombic Dodecahedron has a very interesting property: it fills space. What I mean by that is that you can stack them up to pack together perfectly, with no open spaces between. This is a pretty rare property: the only Platonic solid that fills space is the cube; the only Archimedean solid that fills space is the Truncated Octahedron; and the only Catalan solid that fills space is the Rhombic Dodecahedron. For more information see "Simplicity is not Simple: Tesselations and Modular Architecture", the cover article for Math Horizons about Gregg Fleishman's space-filling housing units that I wrote with Eugenie Hunsicker of Loughborough University in 2002. 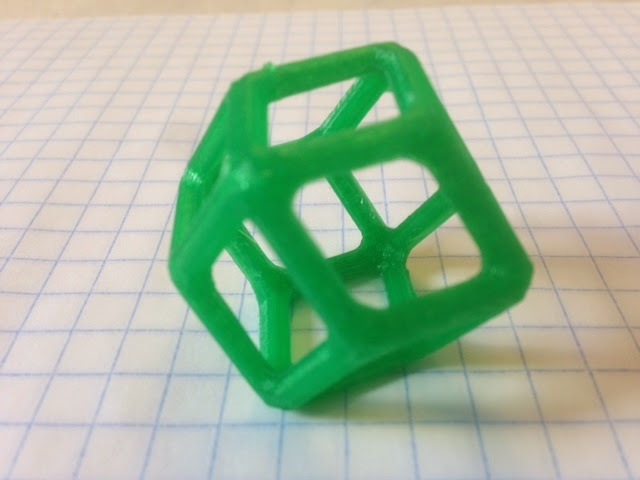 Twelve years later I can now finally stack up a handful of Rhombic Dodecahedra and see for myself!